The image at left shows the microscope beam splitter on a compound high school microscope. 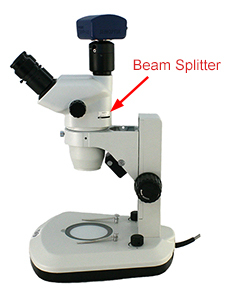 In order to engage the beam splitter (and send light up to the camera), the lever must be pulled out away from the microscope. When the camera is not in use, the beam splitter is pushed back in and all the light will go to the eyepieces. 80% light to the camera and 20% to the eyepieces. 100% light to the camera and none to the eyepieces. 80% light to the camera, while one of the eyepieces goes dark and the remaining light is sent to only one eyepiece. A beam splitter that has multiple settings such as sending all light to the camera, all light to the eypeieces and an intermediate option where some of the light goes to both the camera and the eyepieces. It is helpful to know what type of beam splitter the microscope has based on the type of work you wish to perform. If it is important to still be able to view your specimen while the camera is engaged, you will want to ensure that the beam splitter still provides some light to at least one of the eyepieces. Additionally, if you are looking to produce high quality printed images from your microscope, it will be important that the beam splitter has a setting that will send all of the light to the camera. If you have ever used a microscope camera and can't figure out why you are not seeing an image on your camera (or computer monitor), it could be that you simply forgot to engage the beam splitter. If the beam splitter is not engaged, no light will travel to the camera and you would not be able to see your image. The FZ6 stereo microscope shown at right with a Jenoptik microscope camera on it has a slightly different beam splitter than the microscope above. 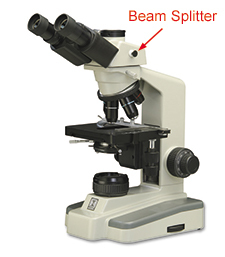 On this microscope the beam splitter is engaged by sliding a lever to the right or left. 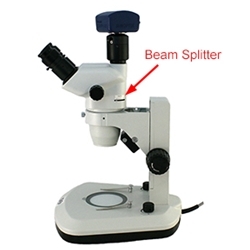 If you are unsure what type of microscope beam splitter would work best for your microscopy photography contact Microscope World and we will be happy to help you sort it out.